The Theater Guild’s creative team (Oscar Hammerstein II, Agnes De Mille, Armina Marshall, Richard Rodgers, Theresa Helburn, and Lawrence Langner) celebrating the fourth anniversary of Oklahoma! on Broadway. Photograph by Ben Mancuso. Image courtesy of the Billy Rose Theatre Division, The New York Public Library Digital Collections. Lynn Riggs’s Green Grow the Lilacs, a play set in Oklahoma Territory at the turn of the twentieth century, opened on Broadway at the Theater Guild in 1931 and ran for sixty-four performances. Guild co-founder Theresa Helburn (1887–1959) was its executive director at the time, but it wasn’t until 1940, when she saw a summer-stock production, with folk dances choreographed by Gene Kelly, that she came up with the idea for turning it into a musical. During previews in New Haven and then in Boston, a reprise of the song “Oklahoma” was added and the title of the musical was changed. Hammerstein later claimed that the new title had been his preference all along, but the rest of the team worried that theatergoers would confuse it with the “Okies” of Steinbeck’s The Grapes of Wrath. Sporting its new name, Oklahoma! opened at the St. James Theatre in New York on March 31, 1943, and ran for 2,212 performances—the longest in Broadway history until My Fair Lady broke the record in 1961. As many as fifteen million tickets were sold during its original Broadway run and the subsequent national tour. 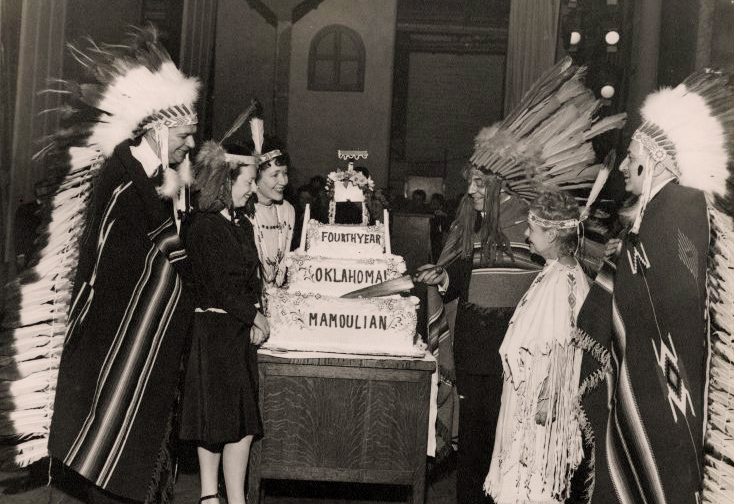 Although the Theatre Guild had had its share of successes during its previous two decades of existence, the overwhelming success of Oklahoma! secured a steady cash flow for many years—and most Broadway insiders readily attributed the triumph to Helburn. Oscar Hammerstein later wrote, “A producer is a rare, paradoxical genius—hard-headed, soft-hearted, cautious, reckless, a hopeful innocent in fair weather, a stern pilot in stormy weather, a mathematician who prefers to ignore the laws of mathematics and trust intuition, a realist, a practical dreamer, a sophisticated gambler, a stage-struck child. That’s a producer. That was Theresa Helburn.” Ten years after the show’s premiere, the best-selling novelist Frances Parkinson Keyes, who had known Helburn since their school days, wrote a profile of her friend for Atlantic Monthly. The headnote that precedes Keyes’s biographical sketch was provided by theater and drama scholar Laurence Senelick. I have never lost my sense of sustained excitement, mingled with keen enjoyment, at a theatrical opening. The lights blazing above the entrance. The mounted police dashing back and forth. The long lines of shining limousines. The sidewalk crowds surging around nonchalant celebrities. . . . If you don't see the full selection below, click here (PDF) or click here (Google Docs) to read it—free!